This is one festival that held me in absolute charm ever since childhood. Of Course, Indian festivals have that in them to bring out the child like enthusiasm from everyone celebrating it. Ganesh Chaturthi however is personally significant to me in many ways. In childhood, the festival was an occasion where all my cousins came to my native town. The morning’s Pooja was usually followed up with a competition of eating the maximum kudumulu (Deep fried modakams that we used to prepare) and in the evenings, we used to tour the Pandals in the locality. Growing up, the ecological concerns around the festival grew. One can blame it on excessive ranting by those who feel the Ganesh pandals block their usual roads. Cannot deny the inconvenience for sure. But a bigger concern was of the water pollution caused when the hundreds of idols of all sizes would be immersed in the local tanks and lakes for the Visarjan. As mud idols made way for the gypsum statues, the concern was huge. 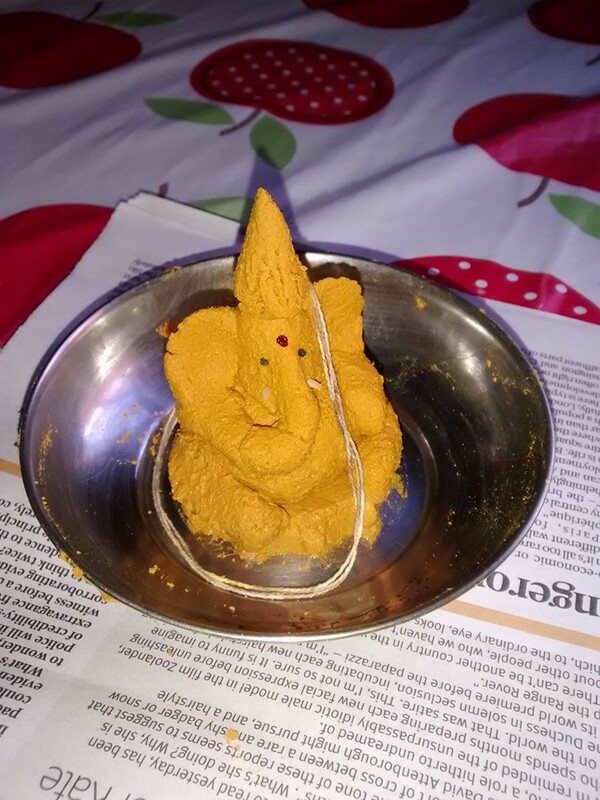 Visarjan involves in immersing this turmeric idol into a vessel of water which subsequently would be disposed in the garden. I love this method for its sheer eco-friendliness. Those aware of the pooja-vidhana for Ganesh chaturthi would realize that this festival is a lot about conserving nature. The divine elephant headed remover of obstacles himself represents the nature around us. The rituals where worship is offered with 21 different types of leaves, a procedure where only Dhurvayugma (Grass) is used for the worship along with flowers are all a reminder to every worshipper about protecting and conserving nature! Sermonizing is not something I like to do in my blogs. But I would request every Hindu to ponder over how eco-friendly his or her Ganesh Chaturthi is. We love our Gods and they are not just of the past, but are our past, present and future. The true worship we can offer this delightful son of Parvati, the daughter of Snow mountains and Pashupati, the Lord of all beings, is our deep sense of reverence to mother nature.